Afrodita by Hernán Piñera via Flickr. #MuseumWeek logo has been added by M&G NSW. Museum Week is only two weeks away! It’s a worldwide cultural event that takes place on twitter from 28 March to 3 April. Each day has a different theme and hashtag. 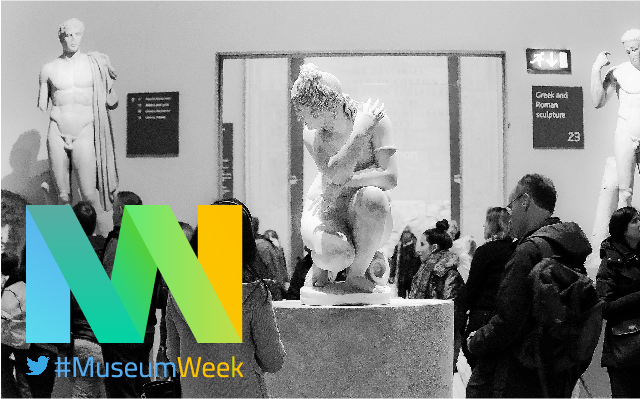 All you need to do is register on the website and post at least one tweet per day using the #MuseumWeek hashtag. If you have been looking to get started on twitter it’s a great opportunity to leverage off an existing brand. Those of you who are already active tweeters can grow your twitter profile, gain new followers and promote your organisation. We’ve created a checklist to help you get the most out of the week. Register your museum as a participant and download the graphics elements package. This includes a twitter banner, logos and posters to print out. You can use these to add elements to your tweets and visually connect yourself with the campaign. There are also FAQs, interviews with past participants and tip and tricks of the trade. Encourage people to tweet about your museum. This includes staff and visitors. Give key staff across the organisation access to your twitter feed to post throughout the week. Choose people with different perspectives, conservators, visitor services staff, curators or volunteers. Post signage throughout the museum encouraging visitors to post images about their experience of your museum. Look over the themes for each day and curate some content you would like to feature. Schedule tweets to post automatically on the appropriate days, you can do this through social media management programs like Hootsuite. This will reduce the stress of having to create new content every day and ensure you have regular posts. Create reasons for visitors to post with your hashtag. Everyone that posts gets a discount at the café or the best post of each day receives free entry on their next visit. A little goes a long way towards getting people engaged. Twitter is great for conversations and an active twitter feed is a two way street. Answer any questions and if you’re not sure of the answers offer to find out and respond later when you have the information. If you’re new to twitter or just need a refresher have a look at our online resource ABC of Twitter.